This pic was sent to us from Gerry Maciok. It was the 5th and final fish speared durning the MI. Season. Gerry says the kid in the red coat stuck it. 102lbs! 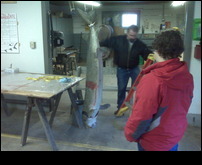 Makes me want to go sturgeon spearing! Anyone else that was lucky enough to stick a sturgeon, lets see some pics!!! I know, i would love to get into one! Not sure if you can see it in the small pic but kid put a great shot on it too.